Product prices and availability are accurate as of 2019-04-14 15:19:23 EDT and are subject to change. Any price and availability information displayed on http://www.amazon.com/ at the time of purchase will apply to the purchase of this product. The Streetwise IP wireless camera features video and audio, night-vision, pan/tilt, remote Internet viewing, two - way communication, a built in video recording system, as well as motion activated notifications, recording and alarm. 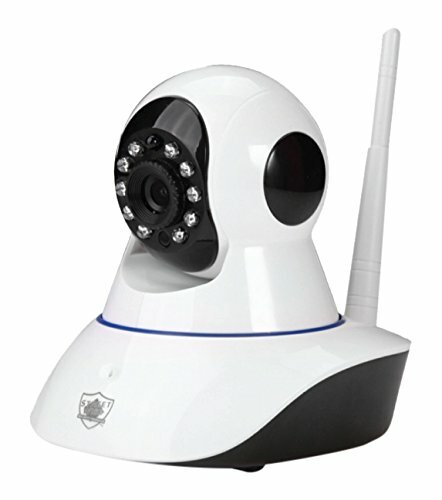 You can connect the camera to the Internet via a wireless Wi-Fi connection or with an Ethernet cable. Once the camera is connected to the Internet you can view it on your Smart phone by simply downloading the free app. One of the best features of this security camera is the motion activated alarm and alert system (this is an option that can be activated in the settings). in this mode when an Intruder enters your home or office, the camera senses motion and sounds an alarm. Your mobile device will notify you of an incoming call. When you "answer" the call you will see a live video feed and can communicate with the person who triggered the alert and decide if there is a need to call the police. A father traveling anywhere in the world can see and talk with his family or parents can know when their children return home from school and they can monitor them to insure their safety. Even when you're not able to monitor the camera on your Smart phone the SWIPC can be set to record whenever it detects motion. The camera supports up to 64GB Micro SD card (not included). it will record high quality HD video in any lighting conditions, even in complete darkness, the latest night vision technology provides you with crystal clear video images. The camera can be set on a table or you can use the included mounting bracket to easily install it on the wall or ceiling. The cameras unique pan and tilt feature allows it to view all angles of the room. This feature is operated by remote control from your Smart phone or tablet by simply swiping your finger up/down or across your phone.